Demi-Leigh Nel-Peters of South Africa is the new Miss Universe! But before she claimed the crown, Demi-Leigh and the rest of the Top 3 contestants, Laura Gonzalez of Colombia and Davina Bennett of Jamaica, had an opportunity to give their final word on the same question: "What quality in yourself are you most proud of and how will you apply that quality to your time as Miss Universe?" 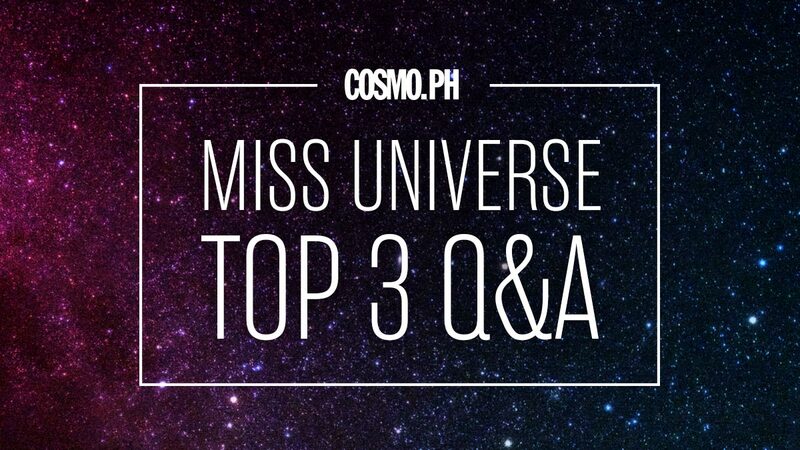 Answer: "As Miss Universe you have to be confident in who you are as an individual. A Miss Universe is a woman [who] has overcome many fears, and, by that, she is able to help other women overcome their fears. She is a woman that nothing is ever too much to ask for, and I think that is exactly who I am." Answer: "I am incredibly compassionate about everything I do. I have discipline. With compassion, I put my whole self in every situation that I work [on]. I've done this as an actress, I've done this as [Miss] Colombia, and I do not doubt that I would do this as Miss Universe." Answer: "The quality I am most appreciative of is my drive, my determination. I am the founder of a foundation that spreads awareness for the deaf community, and this platform is such a great platform to just let [people] know that these persons need opportunities and equal opportunities like those in society. And so the Miss Universe competition will be the platform for me to use this foundation to spread awareness for all the deaf people around."